Spousal abuse is a potentially life-threatening situation—the seriousness of which cannot be overstated. If you or your children are experiencing physical violence, or even the threat of physical violence, from your current or former spouse, you should seek advice from your attorney immediately about obtaining a domestic abuse protection order. To obtain a domestic abuse protection order for you or your children, you must be either the current or former spouse of the abuser, a current or former romantic partner of the abuser, the parent of an abused child (whose other parent is the abuser), or the parent or child of the abuser. 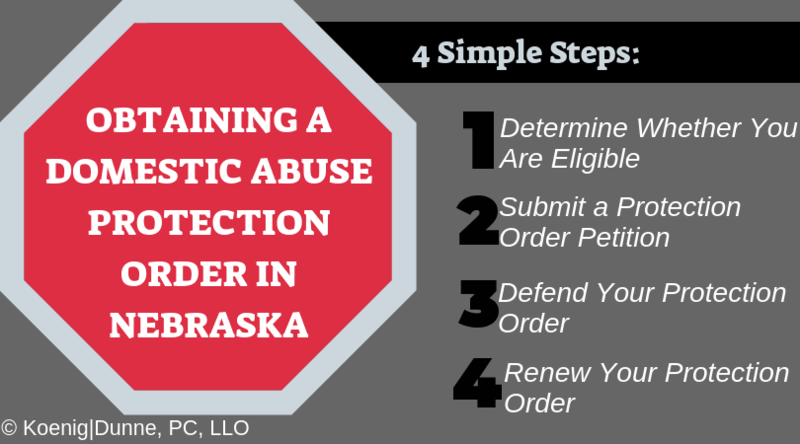 Another requirement under Nebraska law to obtain a domestic abuse protection order is that you or your child are presently in fear of bodily harm by the abuser. If you are eligible to apply for a domestic abuse protection order, the next step is to completed and submit a domestic abuse protection order petition to your local courthouse. You will need to describe the reasons why you feel a protection order is necessary. It is critical to be as detailed as possible when describing the incidents necessitating your request. After you have submitted the petition to the Court, it will be reviewed (which can take either a few minutes or a few days). If the Court feels that there is enough evidence to support your petition, a protection order will be granted and instructions given to the local sheriff to serve a copy of the protection order to the abuser, referred to as “the respondent.” The protection order does not go into effect until the sheriff has successfully provided a copy of same to the respondent. Once the respondent is provided with the protection order by the local sheriff, he or she has the ability to contest the protection order at a trial-like hearing. The respondent must request this hearing within five days of receiving the protection order. If the respondent does not contest the protection order, the order will last for one year from the time that it is issued. If the respondent does contest the protection order, contact your attorney immediately to determine what actions you should take to defend your petition in court. As mentioned above, a domestic abuse protection order lasts for one year. If you feel that the protection order is needed beyond a year, you may request that the Court renews your protection order. Your legal team at Koenig|Dunne is here to provide guidance and advocacy in obtaining domestic violence protection orders to ensure that you and your family are safe.